Norwegian Warrior Oddekalv Takes on Marine Harvest in Scotland! Kurt Oddekalv, leader of the Green Warriors of Norway, arrived in Scotland last night (7 November) to kick off an inspection visit of Norwegian-owned salmon farms. 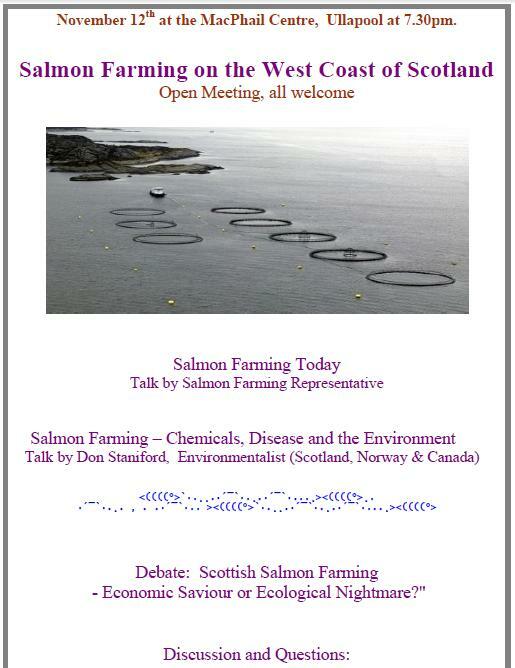 Oddekalv will join Don Staniford of GAAIA and Elena Edwards of Wild Salmon First in addessing a public meeting tonight (8 November) on the Isle of Skye where locals are opposed to expansion plans by Marine Harvest (owned by Norwegian billionnaire John Fredriksen). "Staniford and Oddekalv are unquestionably the global salmon aquaculture industry's boldest foes," wrote Damien Gillis in The Common Sense Canadian. "Both employ provocative tactics that consistently get under the industry's skin. Their partnership is the salmon activist equivalent of Che Guevara and Fidel Castro joining forces." Read more via "Bad Boy Activists Teaming Up in Norway"
Kurt Oddekalv is a Norwegian version of Sea Shepherd activist Paul Watson and his boat - the Eco-Queen - is very much in the mould of Greenpeace's 'Rainbow Warrior'. The Norwegian media dubbed Kurt Oddekalv 'James Bond' when the Eco-Queen (complete with helipad and gadgets straight out of the 007 films) was launched in 2006. In March this year, the Office of the Auditor General of Norway issued a damning report condemning Norway's salmon farming industry for the spread of infectious diseaes, contaminated wastes, sea lice and escapes. Read more via "Norway Fails Salmon Farm Audit"
Read more via "Norway's Salmon Shame"
Locals are rising up against Marine Harvest's plans to expand on the Isle of Skye. The front page of the local newspaper, the West Highland Free Press (2 November), referred to "overwhelming opposition" at a public meeting in Sleat last week. "At last Thursday’s meeting in Sabhal Mòr Ostaig 39 of those present opposed the development, with two voting in favour and three abstaining," reported the West Highland Free Press (2 November). "Marine Harvest have lodged plans for a 12-pen site, which they say will create seven new jobs in the area. But residents on the Sleat side of the loch have expressed opposition — largely on environmental grounds — and say they were not consulted on the development."